Geisya Cafe (ゲイシャカフェ) is the photo studio where you can take a picture of yourself wearing Japanese traditional wigs, such as Samurai, Geisya or Maiko, and Kimono, the Japanese cloth. At Geisya Cafe, they prepare everything for you, so you just visit there. 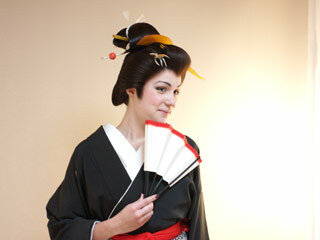 So, if you want to try Japanese wig and kimono, visit Geisya Cafe. You will have 2 sets of photo and entire digital data of photo. Photo session is not only used as your memorial, but also used as the promotion tools and wedding. Some times, the champion of boxers visit here and use their Samurai photo for their championship games. Geisya Cafe is the run by Taiyo Katsura. Taiyo Katsura produces Japanese wig for movie, TV and showcases. So, you can also order your own wig. It is all order made to fit your head. The accessories are come with the wig, and the hair of wig is real human's hair. Price: 200,000 to 300,000 yen. They also rent their wigs. They prepares all aspect of samurai movie scenes. They also have the professional assistant for the wig stylist. Specialist: 26,250 for Tokyo area, additional fee for far side of Tokyo. Those making or rental wig are not only for movie and show case, it is also used for Japanese Traditional dance performance, and any other traditional Japanese events. They offer you the great help for your Japanese show! English is OK. Not perfectly available.